Every year, our 2-man teams supply around 5 million customers with furniture and large appliances, right into the apartment or down to the basement. Hermes Einrichtungs Service is your reliable partner when it comes to the delivery of furniture and large home appliances. Hermes Einrichtungs Service headquartered in Löhne supplies customers in Germany, Austria and Switzerland. Hermes Einrichtungs Service is the market leader in delivering furniture, large electrical appliances and other heavy and sensitive goods to end customers. As part of the Hermes group and thus the Otto Group, which operates worldwide, Hermes Einrichtungs Service GmbH & Co. KG has been delivering furniture and large electrical appliances to end customers for over 50 years, offering a unique full service. The modern headquarter of Hermes Einrichtungs Service is based in Löhne, Westphalia, and employs around 170 people who control all logistical processes in Germany and the neighboring countries Austria, Switzerland and the Netherlands. With more than 60 national and international locations, we provide a reliable and customer-oriented service comprehensively. Environmental protection is an important topic, especially in the logistics industry. 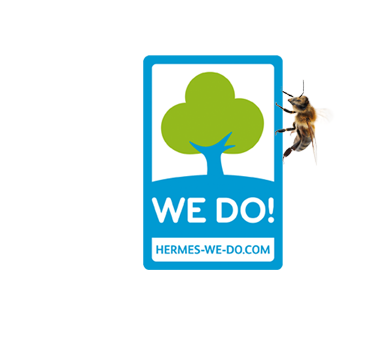 Hermes is also aware of his responsibility here, and in the year 2010 we launched a comprehensive and consistent group initiative under the name »Hermes - WE DO!«. The industry's unique climate and environmental protection program holistically bundles the efficient use of resources across all business sectors. It includes all divisions and also takes into account upstream and downstream steps in the logistics chain. The core is a CO2 master plan that covers all current and future environmental protection activities. The goal is to reduce CO2 emissions by 30% in the transport sector by 2020 and at least 50% at the sites. To support the local beekeepers in the fight against bee mortality, the HES provides the meadow next to the administration building as a location for a bee colony.